I recently co-hosted a baby shower for a friend of mine, who was expecting a baby boy. Seeing as she and her husband are huge Star Wars fans, we decided to make the shower space-themed. Of course I was in charge of desserts, and one of my contributions was this batch of planet cookies. I started off with my favorite chocolate cutout cookie recipe, which I cut into circles of varying sizes and baked. Then I made a batch of my cream cheese fondant and tinted it yellow, blue, green, and red. So I was making pink biscuits to go with the pink molded salad— it was originally just a one-off so I would have something else in the photo, but then I was adding food coloring to the buttermilk when I decided that I’d inadvertently made the milk too pink. I had to add extra buttermilk until the color was right, but I ended up with twice as much buttermilk as I needed before I was done! Since I had all my ingredients out already I decided to make a double batch of biscuits, but to avoid repetition I decided to change things up a bit and make these sweeter for a more springtime feel! I added sugar to the dough, cut the second batch out in flower shapes, and put on a powdered sugar glaze at the end. The biscuits didn’t hold their shape as well as I’d have liked, but they did end up being vaguely flowery-looking, enough so that I felt comfortable dubbing them “cherry blossom biscuits” (though I didn’t have any cherry blossom essence, so it’s just for looks, unfortunately). After my Cordon Bleu bread-baking course, you’d think I’d be a baguette snob– insisting on fresh yeast, hand-kneading, and traditional techniques– but my inherent laziness always wins the day when it comes to things like this. So when I decided to host a dinner party where baguettes were on the menu I split the difference between store-bought and traditionally made, trying out a recipe from King Arthur Flour that’s practically no-knead and does most of its rising in the refrigerator. The results? Decent, but not fabulous. It might have been my own fault, since I have the sneaking suspicion I might have let the loaves rise too much before baking, and I didn’t have a spray bottle to spritz the crusts with water before putting them in the oven. But I did put a pan of boiling water on the bottom rack to create steam, so that should’ve helped. 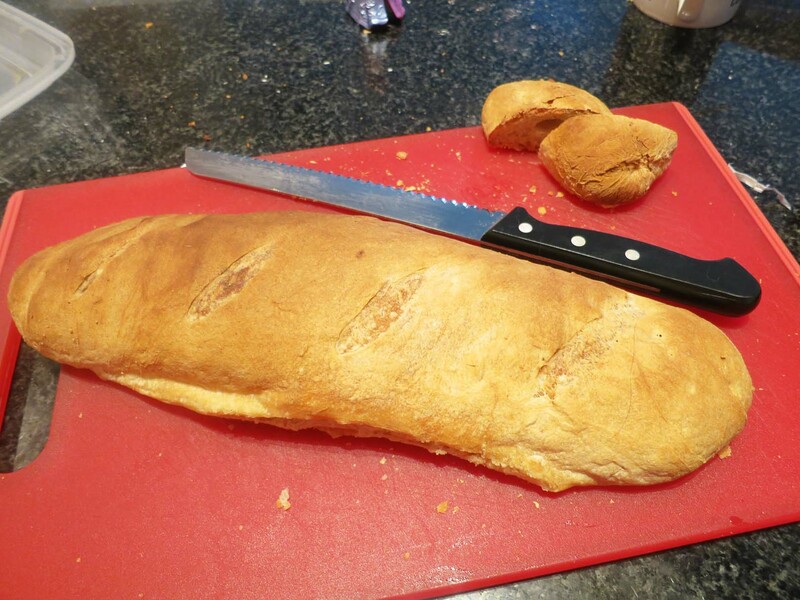 The bread itself was well-flavored and the texture was decent inside, but the crust was overly thick– probably the spritzing issue– and the loaf was pretty flat, not rounded and high the way I’d have wanted it to be. Still, it was tasty bread for a lot less effort than the hand-kneaded ones I made at Le Cordon Bleu, so I’m counting it in the win column.